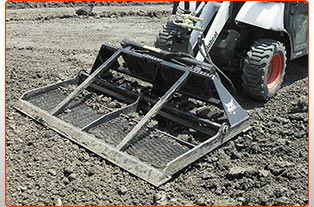 Level and grade soil with this attachment for Mini Bobcats or Track Loaders. Has retractable ripping teeth, dual cutting/grading edges for forward or reverse motion while fine grading fill or hardpan soil. * Please call us for any questions on our bobcat/dingo 48 inch landplane rentals in Portland OR, Gresham OR, Milwaukee OR, and surrounding metro area.